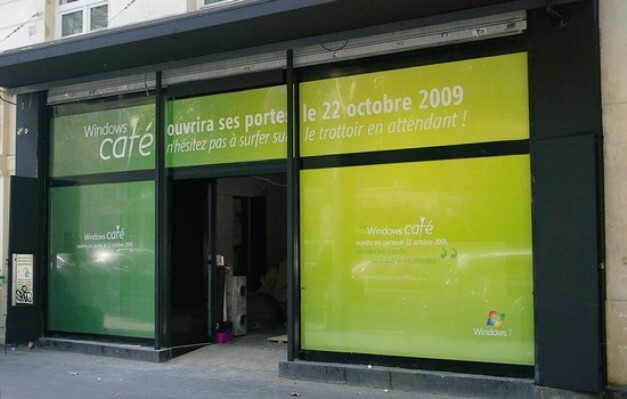 Microsoft is close to opening retail stores in several major cities across the planet, but in Paris they’re doing something special in anticipation of the real shops and the imminent launch of the Windows 7 operating system. Microsoft France has surprised inhabitants and visitors of the French capital with the public preparation of a genuine coffee shop / cafe situated in the heart of the city (47 Boulevard Sebastopol). The Windows Cafe, which will only be open to the public for a couple of weeks starting October 22nd, will boast a number of Microsoft products that visitors can play around with (Xbox, mobile devices and more) but they will not be able to purchase anything there besides snacks and drinks. I’m dying to know what these will be called, though. Will we be able to sip a Bing Cappuccino? Devour A Windows Live Fruit Cocktail? Or have a taste of Blackberry Pie Service Pack 2?